JUGHEAD IN JAPAN: AN INTERVIEW WITH JOHN PIERSON | IKIMASHO! The co-founder of Screeching Weasel and Even in Blackouts chats to Ikimasho! about Japan, music… and popcorn. John ‘Jughead’ Pierson is a busy man. Not content with forming one of the most influential pop-punk bands of all time – Screeching Weasel – he is also a playright, novelist and actor. Now, he has went one step further – moving from Chicago to Osaka to work for Universal Studios Japan. I asked Jughead how he was settling in, picking his brain about daily life in his new country. On a personal note, my teenage years were defined by the music John wrote, inspiring me to pick up a guitar and tour in a band of my own. So for him to guest on this site is pretty awesome to say the least. So how are you settling in? Any culture shock or weirdness or you doing good? Not much culture shock. I’ve had some experience with being in countries where I don’t speak the language, and am fairly used to feeling alienated. Often I enjoy that feeling, it helps the writer in me. But actually not much shock or alienation here in Japan. I am working at Universal Studios Osaka Japan, so I am pretty much surrounded by english speakers every day. I guess I feel a bit more drained at the end of each day, I think for two main reasons; we are constantly given instructions in two languages, and learning the Japanese language for my particular script for a Universal show is exhausting. But overall I love the challenge of figuring out how to order food, not getting hit by cars while riding my bike, and beginning to understand the subtext of a culture that doesn’t like to say “no.” and focuses more on the action in space around objects than the objects themselves. My dad lived in Osaka when he was 22 and I had a penpal from Saitama when I was 11. So i guess I’ve always had an interest in Japan. Others come here knowing virtually nothing about the country. What about you? Japan was always a goal for me. I wanted to tour here ever since the first days of Screeching Weasel, but it was hard enough to get Ben to tour at all, and heaven forbid we go to another country. I would have loved to have gone with Even In Blackouts, but our fan base seemed more Northern European based than Asia based. I couldn’t get anything booked. I have always loved Japanese movies, especially Japanese horror films. And my best friend as a child was Japanese and he had these wonderful pop-up books that were in kanji, and I always loved to look through them at the beautiful artwork and word structures. It was a dream fulfilled to be able to come to Japan, and not have to worry about the financial aspect of making it happen. And even more exciting to be here as a visa working person and not as a tourist, I don’t really enjoy being a tourist. I know contractually you cant talk about the specifics of your job, but it’s just so utterly random. Where did you even hear about it? What made you apply? I can say that I was hired to work at Universal Studios in Japan. The auditions to work at USJ take place all over America, Australia The UK, and a few other countries. My girlfriend, Paige, heard about the recent auditions and scheduled times for both of us. The monologue to be learned was in Japanese tinged with a few lines in english with a british dialect. I have done a british accent before but have never been good at it. I had never spoken Japanese before at all. What I learned for the audition was taught to me in a day or two by Paige. They seemed to really like me at the audition. I’m not quite sure why, but I have been told in retrospect it had something to do with my charismatic smile (their words not mine.) and the fact that for some reason the british couldn’t get down the Japanese part of the script which if that weren’t the case would have diminished the likelihood of me having gotten the job. You’re gonna be busy. But do you think you’ll travel around Japan while you’re here, or even the rest of SE Asia? We get two days off a week and a hand full of vacation days. I will be here at least ten months and I hope to see as much of the country as possible. I recently was also commissioned by an American Radio Station in Wisconsin to write short audio stories about traveling in Asia. They hope to set me up with hotels, museums, and restaurants across the country in which to write about. An old friend read a post of mine recently and offered me the position. This hopefully will allow me to see a goodly portion of the country. I was fairly surprised of the extreme price differences. I was either expecting everything to be more expensive than Chicago or less likely cheaper than Chicago. It turns out that much is extremely cheaper, like most meal items. I can live off of about 25 American dollars a day. Minus a few items that are much cheaper in the states, predominantly Fruit. And for some reason most of the Americans I am with here are eating way more sweets than they eat in the states. This may be because of the lightness of the desserts and perhaps better use of sugar. But then again I think much of the sweets here, including bread which is mostly sweet, are made out of chemicals. The people are very nice, but I definitely can feel the reality of the old story about how pleasant the japanese are, but that if you are a foreigner you will always be a foreigner no matter how much language and tradition you learn and adopt. I think that is why the term Gaijin is batted around so much. They appear to be very culturally protective. But If I look lost on the street or in a train station it doesn’t take long for a stranger to come up and try to offer help. And anything you miss from back home? I miss popcorn. I am used to eating popcorn almost every day. It’s fairly easy to find popcorn shops in Osaka, but I prefer popping it myself. And I have yet to find popcorn seed in a market. I’m sure there is some around somewhere. So far I have just missed having it without much actual laborious searching for it. I miss my bandmates Gub Scott Conway, Liz Eldredge, John Szymanski, and John Bliss. I also miss visiting my mother, sister and nephew. Other than that, I think it is pretty great to be in Japan. I can’t imagine being bored for long with so much to see, and places to travel, but… I guess I would be a bit more happy with a few more accessible movie theaters, especially ones with popcorn. Tell me a little story about a random experience you’ve had in Japan so far. Anything! I’ve been in rehearsals for so long each day that I haven’t had much of a chance to experience much weirdness. I can mention an incident with me and Paige, she has written about it on her site, but it’s worth mentioning here. A friend, Hiroaki from the punk band The Wimpy’s and his wife Rebecca brought us to Kyoto. Paige has studied Geisha and Japanese culture since she was quite young, but she has never been here before now. We were on the search for a theater where we would see, amongst other traditional japanese performances, a Geisha or two performing a storytelling dance. We got lost on the side streets on our way there and ended up on a deserted street in Gion. The old Japanese structures our hosts casually walked by made our eyes pop and our mouths were agape. Paige said, “I feel like we are on the set of a movie.” As she spoke these words a Geisha, alone, in full glorious and colorful attire, emerged from a door and strolled elegantly past us. Paige began weeping. Profusely. It may seem to sound like such a simple experience, but in that moment it was one of the most beautifully random events we had ever experienced. The whole concept of Even In Blackouts was that you could play anywhere anytime cos you use acoustic guitars etc. I guess thats true for music and travel too. Did you bring a guitar with you to Japan and will you be writing/playing? I brought an acoustic guitar, a banjo, and a ukulele. I don’t know if I’ll be writing any music I just wanted to keep in practice while I am away from Chicago. Recently I was excited to hear that Gub and Liz back home have started working on some new songs for us. Also I have made tentative plans to play at least one show with Osaka local bands The Wimpys and The Disgusteens. We’ll probably play a bunch of Screeching Weasel and Mopes songs, and hopefully I’ll play along with them on some of their songs. Which brings me to tunes. I read on Facebook you like to go running in Osaka by the river. What do you listen to? I used to only listen to upbeat music, not just punk but a bunch of 80’s bands like Oingo Boingo, Devo, Wonderstuff, and Australian band The Hoodoo Gurus, but for the last year I have been listening mostly to philosophy podcasts and on other nights, slower contemplative music like Jim Croce, Nick Drake, and Cat Stevens. I find it more challenging to run fast to slower music, and it helps me keep my mind calmly focused. I quite enjoy that. OK lastly it wouldn’t be a Jughead interview if i didn’t ask you what your favourite Screeching Weasel song was…. What We Hate, Slogans, Guest List, Super Market Fantasy, Teenage Slumber Party, Going Home, and Speed Of Mutation. Those are the first to come to mind. Pingback: IKIMASHO! 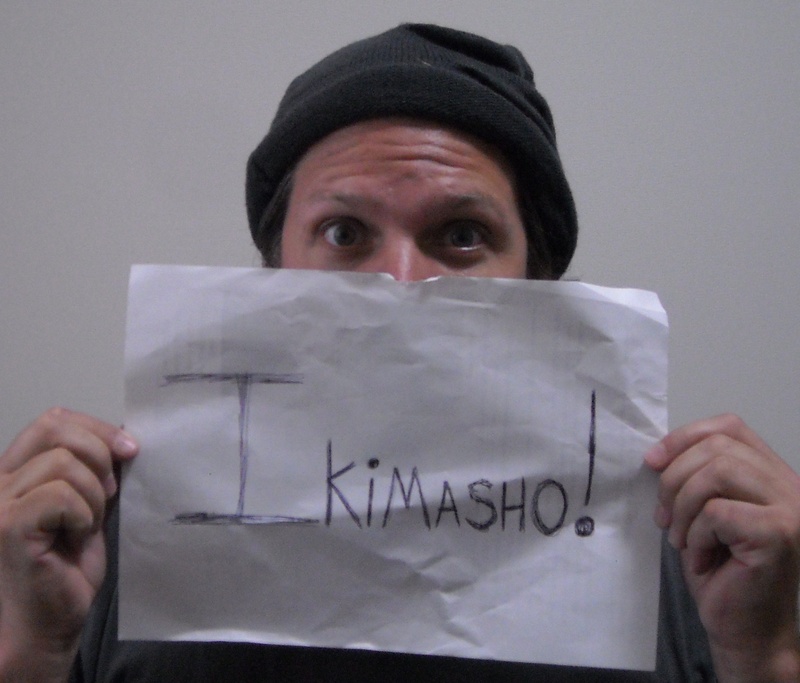 YOUTUBE SESSIONS: THE QUEERS | Ikimasho! Pingback: IKIMASHO! YOUTUBE SESSIONS: JESSE MICHAELS | Ikimasho! Pingback: IKIMASHO! x TEENAGE BOTTLEROCKET | Ikimasho! Pingback: John Jughead Pierson: My Brain Hurts Revisited | Ikimasho! Pingback: IKIMASHO! x DROPKICK MURPHYS | Ikimasho!